Grisly footage of the man’s death at the hands of a mob has been widely circulated on social media. 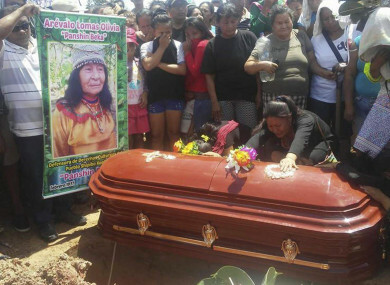 People cry over the coffin of plant healer Olivia Arevalo during her burial in Ucayali, Peru. PERUVIAN POLICE HUNTED today for two men wanted in connection with the lynching of a Canadian man suspected of killing an elderly female shaman in a remote part of the country’s Amazon rainforest. The body of Sebastian Paul Woodroffe, 42, was discovered Saturday in the Ucayali region of northeastern Peru bordering Brazil, not far from where the 81-year-old woman was killed a few days earlier. Grisly footage of Woodroffe’s death at the hands of a mob has been widely circulated on social media. In the video, a man is seen making aggressive attempts to put a black rope around the neck of another man slumped in a puddle with blood on his face who tries – unsuccessfully – to fight him off. Judge David Panduro ordered the arrest of two suspects – identified as Jose Ramirez and Nicolas Mori – for the “alleged offence of aggravated homicide”. Prosecutors said the cause of Woodroffe’s death was strangulation, noting there was also evidence of multiple other injuries. They said Woodroffe’s lynching was linked to the murder of Olivia Arevalo, an 81-year-old healer, rights activist and respected leader within the indigenous Shipibo-Konibo community who was shot dead on 19 April. According to a local rights group, a man with a foreign accent went to her home and when she opened the door, he opened fire at short range before fleeing on a motorcycle. Police immediately launched a search for the main suspect, whom they identified as a Canadian national. They found Woodroffe’s body buried nearby on Saturday. The men wanted for his death are members of Arevalo’s community. Unpaid debt or ayahuasca dispute? Within the Shipibo-Konibo community, Arevalo was a healer widely revered for her knowledge of traditional medicine who was believed to have special powers. Prosecutor Ricardo Jimenez said police believed one of the main motives for the murder was an unpaid debt of 14,000 Peruvian soles (€3,514) that Arevalo’s son owed to Woodroffe. “The hypothesis is that the Canadian may have had some kind of dealings with Olivia Arevalo over the loan of some money,” he told reporters in Pucallpa, a town in the Ucayali region. Apparently he didn’t pay the money back and this murder was revenge. This is the hypothesis that we are working on. But media reports said police were also working on another theory: that Woodroffe killed the shaman because she refused to let him participate in an ayahuasca ceremony. Ayahuasca is a powerful hallucinogenic concoction from the Amazon consumed as part of a shamanic ritual. The elderly shaman’s murder has shocked Peru, with Prime Minister Cesar Villanueva promising to do everything to find the person responsible. “Being of Amazonian origin myself, I feel very dismayed by the murder of Olivia Arevalo,” he wrote on Twitter. The French chapter of Friends of the Earth described her as “the memory of her people”, saying she had “dedicated her life to defending and promoting the culture, traditions and songs of the Shipibo people, and lamenting her death as “a terrible loss”. Her murder was also condemned by EarthRights International, who described her as a defender of environmental rights and said she had “suffered the consequences of a lack of government protection and a guarantee to exercise her rights without being harmed”. There are some 31,000 ethnic Shipibo-Konibo people living in Peru’s Amazon jungle region. In September 2014, four leaders of the indigenous Ashaninka people were killed in the Ucayali region after illegal loggers and drug traffickers had threatened them. Email “Peru police hunt for men wanted in connection with lynching of Canadian man suspected of killing elderly shaman”. Feedback on “Peru police hunt for men wanted in connection with lynching of Canadian man suspected of killing elderly shaman”.